Commercial Orbital Transportation Services (COTS) was a NASA program to coordinate the delivery of crew and cargo to the International Space Station by private companies. The program was announced on January 18, 2006 and successfully flew all cargo demonstration flights by September 2013. NASA has suggested that "Commercial services to ISS will be necessary through at least 2015." COTS is related but separate from the Commercial Resupply Services (CRS) program. COTS relates to the development of the vehicles, CRS to the actual deliveries. COTS involves a number of Space Act Agreements, with NASA providing milestone-based payments. COTS does not involve binding contracts. CRS on the other hand does involve legally binding contracts, which means the suppliers would be liable if they failed to perform. Commercial Crew Development (CCDev) is a related program, aimed specifically at developing crew rotation services. It is similar to COTS-D. All three programs are managed by NASA's Commercial Crew and Cargo Program Office (C3PO). Unlike any previous NASA project, the proposed spacecraft are intended to be owned and financed primarily by the companies themselves and will be designed to serve both U.S. government agencies and commercial customers. NASA will contract for missions as its needs become clear. NASA explored a program for ISS services in the mid 1990s entitled "Alt Access" for Alternate Access. While NASA funded Alt Access no further than preliminary studies, this program convinced numerous entrepreneurs that ISS could emerge as a significant market opportunity. With the advent of the ISS, there will exist for the first time a strong, identifiable market for "routine" transportation service to and from LEO, and that this will be only the first step in what will be a huge opportunity for truly commercial space enterprise. We believe that when we engage the engine of competition, these services will be provided in a more cost-effective fashion than when the government has to do it. Furthermore, if such services were unavailable by the end of 2010, NASA would've been forced to purchase orbital transportation services on foreign spacecraft such as the Russian Federal Space Agency's Soyuz and Progress spacecraft, the European Space Agency's Automated Transfer Vehicle, or the Japan Aerospace Exploration Agency's H-II Transfer Vehicle since NASA's own Crew Exploration Vehicle, since refocused, would not have been ready until 2014. NASA asserted that once COTS was operational, it would no longer procure Russian cargo delivery services. On May 22, 2012, Bill Gerstenmaier confirmed that NASA was no longer purchasing any cargo resupply services from Russia and would rely solely on the American CRS vehicles, the SpaceX Dragon and Orbital Sciences' Cygnus; with the exception of a few vehicle-specific payloads delivered on the European ATV and the Japanese HTV. NASA anticipates that COTS services to ISS will be necessary through at least 2015. NASA projects at most a half-dozen COTS flights a year that would transport 10 tonnes annually. The NASA Administrator has suggested that space transportation services procurement may be expanded to orbital fuel depots and lunar surface deliveries should the first phase of COTS prove successful. In May 2006, NASA selected six semifinalist proposals for further evaluation. 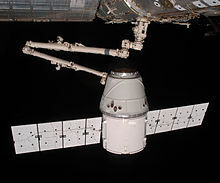 On August 18, 2006, NASA's Exploration Systems Mission Directorate (ESMD) announced that SpaceX and Rocketplane Kistler (RpK) won Phase I of the COTS program. NASA planned to engage winners in funded Space Act agreements through 2010. On November 8, 2006 RpK and ATK announced that ATK would become the lead contractor for the K-1. NASA terminated the COTS agreement with RpK in September 2007 after NASA warned RpK that it had failed to raise sufficient private funding by the July 31, 2007 deadline, freeing up $175 million from the COTS budget to be awarded to another company or companies. Boeing submitted a proposal in conjunction with Arianespace to launch the ESA ATV module on a Delta IV rocket. Whereas the ESA launches the ATV on an Ariane 5, the two companies worked together to make this proposal. The ATV can carry up to 7.6 metric tons with a suitable launcher. By June 18, 2007, NASA had signed separate non-reimbursable Space Act Agreements with four firms. These agreements included no financial support, however NASA agreed to share information to help the companies to develop their proposed vehicles. On October 22, 2007, NASA solicited proposals for the $175 million in unawarded first round funds. Some of the new contenders who entered before the deadline in November 2007 for the funding were Spacehab, t/Space, Andrews Space, PlanetSpace and SpaceDev. In January 2008 industry sources claimed that the field had been downselected to four; Spacehab, Andrews Space, PlanetSpace and Orbital Sciences, with the announcement date set to February 7. Several sources later suggested that Boeing and not Andrews was a final contestant. On February 19, 2008, the second round selection was made to Orbital Sciences Corporation, for the Cygnus spacecraft. NASA's selection statement showed that Orbital beat Boeing on expected lower costs and the added benefit of a new medium lift launcher Taurus II with Andrews, PlanetSpace and Spacehab being eliminated on funding concerns. Following the original $500M Space Act Agreement, an additional $288M in "augmentation" funding was awarded to the two contractors before the demonstration flights. The COTS program was successfully concluded in November 2013 after two companies, SpaceX and Orbital Sciences, designed, built and launched "a pair of new spacecraft on rockets that also were newly designed". NASA has published its own history of the COTS program including the controlling of the development program using Space Act Agreements (SAA), with lessons for future programmes. Rocketplane Kistler — originally awarded contract worth $207 million; Rocketplane Kistler received only $32.1 million before NASA terminated their contract for failure to complete milestones in October 2007. SpaceX — awarded contract worth $278 million; in 2011 additional milestones were added bringing the total contract value to $396 million. On May 22, 2012 SpaceX COTS Demo Flight 2 completed the NASA and SpaceX Space Act Agreement. Falcon 9 #3 flew capsule Dragon C2+ to the International Space Station. After rendezvousing, berthing and unloading the capsule successfully reentered landing in the Pacific Ocean. Orbital Sciences Corporation — awarded contract worth $170 million in the second round in February 2008; in 2011 additional milestones were added bringing the total contract value to $288 million. The Antares (rocket) made its maiden flight lifting a payload mass simulator to low Earth orbit (LEO) on April 21, 2013. On September 18, 2013, Antares successfully launched a Cygnus spacecraft to rendezvous with the International Space Station. More than twenty organizations submitted COTS proposals in March 2006 of which twenty were publicly disclosed. NASA received new COTS proposals from at least seven firms by November 21, 2007. In May 2012, SpaceX completed its final demonstration mission. On December 22, 2008, NASA stated they would discuss the contract selection to provide commercial cargo resupply services for the International Space Station. NASA announced the awarding of contracts to both SpaceX and Orbital Sciences Corporation in a press conference on December 23, 2008. The contracts include a minimum of 20 missions, 12 missions for SpaceX ($1.9 Billion) and 8 missions for Orbital Sciences ($1.6 Billion). PlanetSpace submitted a protest to the Government Accountability Office after receiving a NASA debriefing on the outcome of the award. On April 22, 2009 GAO publicly released its decision to deny the protest. ^ Space Operations Mission Directorate (2006-08-30). "Human Space Flight Transition Plan" (PDF). NASA. ^ a b "NASA Awards Space Station Commercial Resupply Services Contracts". NASA, December 23, 2008. ^ "NASA Releases COTS Final Report" (Press release). NASA. 2014-06-03. Retrieved 2014-06-08. ^ "COTS Vendors". NASA Johnson Space Center. Archived from the original (xls) on 2006-09-29. ^ a b "X Prize Comments by Mike Griffin". NASA. 2006-10-20. Archived from the original on 2009-08-24. Retrieved 2007-06-06. ^ Griffin, Michael; Valin Thorn (2007-01-11). "Commercial Crew & Cargo Program Overview" (PDF). 45th AIAA Aerospace Sciences Meeting. Reno, Nevada: NASA. p. 2. Retrieved 2007-06-06. ^ a b Gerstenmaier, William (2007-05-18). "Need for Commercial Cargo to ISS". FAA Commercial Space Transportation Advisory Council. Washington, D.C.: FAA. p. 2. Archived from the original on 2009-02-26. Retrieved 2007-06-13. ^ "SpaceX/NASA Discuss launch of Falcon 9 rocket and Dragon capsule". NASA. 22 May 2012. Retrieved 23 June 2012. ^ "Commercial Space Development – What’s the Next?". NASA, November 15, 2007. ^ Valin Thorn, "Commercial Crew & Cargo Program Overview," AIAA Aerospace Sciences Meeting, January 11, 2007 (accessed 28 April 2014). See also: Belfiore, Michael (May 9, 2006). "NASA makes first round of cuts for COTS". Dispatches from the Final Frontier. Archived from the original on 2006-06-14. Retrieved 2006-11-21. ^ "NASA Selects Crew and Cargo Transportation to Orbit Partners" (Press release). NASA. 2006-08-18. Retrieved 2006-11-21. ^ "Rocketplane Kistler and ATK Announce Agreement for K-1 Launch Vehicle and COTS Program" (Press release). ATK. 2006-11-08. Retrieved 2006-11-21. ^ "RpK's COTS Contract Terminated". Aviation Week. 2007-09-10. Archived from the original on 2011-05-12. Retrieved 2007-09-10. ^ "NASA Signs Space Act Agreements with Three More Firms". Space News. 2007-06-19. Retrieved 2007-12-11. ^ "NASA Reopens COTS Bidding". Aviation Week. 2007-10-19. Archived from the original on 2011-05-12. Retrieved 2007-10-28. ^ "COTS 1.5 Roundup". Space Fellowship. 2008-01-07. Retrieved 2008-01-12. ^ "NASA Picks Finalists for Space Station Resupply Demonstrations". Imaginova/Space.com. 2008-01-08. Retrieved 2008-01-27. ^ "COTS I ReAward Final Cut Poll". forum.NasaSpaceflight.com. 2008-02-05. ^ "COTS Selection Statement – Feb, 08". forum.NasaSpaceflight.com. 2008-04-24. ^ a b c "Statement of William H. Gerstenmaier Associate Administrator for Space Operations before the Committee on Science, Space and Technology Subcommittee on Space and Aeronautics U.S. House of Representatives" (PDF). U.S. House of Representatives. 26 May 2011. Retrieved 28 April 2014. ^ "Commercial Orbital Transportation Services – A New Era in Spaceflight" (PDF). NASA. February 2014. NASA/SP-2014-617. Retrieved June 4, 2014. ^ "Orbital Successfully Launches First Antares Rocket". press release. Orbital Sciences Corporation. Retrieved April 21, 2013. ^ Josh Byerly, Trent J. Perrotto. "Press RELEASE 13-284 NASA Partner Orbital Sciences Launches Demonstration Mission to Space Station". www.nasa.gov. NASA. Retrieved September 19, 2013. ^ "Private ventures vie to service space station". MSNBC. 2006-03-20. Archived from the original on 2007-11-08. ^ "Space Systems/Loral Proposes Bus for NASA's Cargo Needs" (Press release). Space News. 2007-12-10. Retrieved 2007-12-10. ^ "Orbital and Rocketplane Kistler Announce Strategic Relationship" (Press release). Rocketplane Limited, Inc. 2006-07-24. Retrieved 2006-11-21. ^ "COTS 2006 Demo Competition". NASA. 2012-03-02. Retrieved 2012-11-18. ^ "NASA signs Space Act Agreement with Planetspace" (PDF) (Press release). PlanetSpace. 2007-02-01. Archived from the original (PDF) on 2007-03-17. Retrieved 2007-12-11. ^ "PLANETSPACE, Lockheed Martin and ATK team up to bid on NASA COTS" (PDF) (Press release). PlanetSpace. 2007-11-21. Archived from the original (PDF) on 2008-07-23. Retrieved 2007-12-11. ^ "Strange space bedfellows". MSNBC. Archived from the original on 2007-12-02. ^ Bergin, Chris (2008-01-21). "ATK's new vehicle to provide multi-access options". Archived from the original on 2008-01-24. ^ "Spacehab Finalist as NASA's Commercial Space Station Logistics Supplier" (Press release). SPACEHAB, Inc. 2006-05-10. Retrieved 2006-11-21. ^ "SPACEHAB RESPONDS TO NASA RFP SEEKING COMMERCIAL ISS RESUPPLY MEANS" (Press release). SPACEHAB, Inc. 2007-11-29. Retrieved 2007-12-11. ^ "Orbital To Pull Out of Rocketplane Kistler's COTS Team" (Press release). Space News. 2006-09-25. Retrieved 2007-12-17. ^ Boyle, Alan (2006-03-20). "Private ventures vie to service space station – New Space Race". MSNBC. Retrieved 2013-03-05. ^ "SpaceDev Selected as a Finalist in NASA's Commercial Orbital Transportation Services (COTS) Solicitation" (Press release). SpaceDev, Inc. 2006-05-15. Retrieved 2006-11-21. ^ "SPACEDEV SIGNS SPACE ACT AGREEMENT WITH NASA FOR DEVELOPMENT OF COMMERCIAL ACCESS TO SPACE" (Press release). SpaceDev. 2007-06-18. Retrieved 2007-12-11. ^ "NASA signs agreement with t/Space" (Press release). t/Space. 2007-02-01. Archived from the original on 2007-02-02. Retrieved 2007-12-11. ^ "t/Space enters COTS second round" (Press release). t/Space. 2007-11-29. Archived from the original on 2007-11-30. Retrieved 2007-12-11. ^ "NASA Signs Agreement with CSI" (PDF) (Press release). Constellation Services International, Inc. 2007-06-18. Archived from the original (PDF) on 2007-07-28. Retrieved 2007-12-11. ^ "CONSTELLATION SERVICES INTERNATIONAL AND SPACE SYSTEMS LORAL TEAM ON NASA COTS PROPOSAL USING A U.S. VERSION OF CSI'S LEO EXPRESSSM CARGO SYSTEM" (PDF) (Press release). Constellation Services International, Inc. 2007-12-11. Archived from the original (PDF) on 2009-02-26. Retrieved 2007-12-11. ^ "NASA to Announce Space Station Resupply Services Contract". NASA HQ. 2008-12-22. ^ Morring, Jr., Frank. "Space Station Resupply Contracts Awarded" Archived 2012-03-22 at the Wayback Machine. Aviation Week, December 24, 2008. ^ Chris Bergin (January 15, 2009). "Planetspace officially protest NASA's CRS selection". ^ "B-401016; B-401016.2, PlanetSpace, Inc., April 22, 2009". GAO. April 22, 2009.